For the last few months I have been attending the Select Committee on Interregional Transportation set up by the City of Abbotsford. To some extent this was prompted by a meeting I spoke at there a while ago, when the University of the Fraser Valley students Environment Society held a forum on rail for the valley. There have been all kinds of proposals and studies done on this subject over the years – and more are under way now in various guises. The FVRD, for example, has been trying to damp down citizen enthusiasm for rail with its own study that dismisses it as uneconomic. The potential for rail as an alternative to freeway widening was, of course, always blithely dismissed by the Province, who never really wanted to look at any alternatives. And in a spectacularly inept bit of back pedalling when the Province did announce its “transit plan” (the $14bn one that was to paid for by everyone else – not one of whom had been consulted) the Fraser Valley was left out completely, and promises for Langley and Surrey were as far off into the future as possible. Some SkyTrain extension beyond its present King George terminal, but it would not get to Langley before 2030 at the earliest. The general mood of the South of the Fraser seems to be one of simmering discontent. The BC Liberals seem to have regarded this as home turf where they could not be displaced, and therefore seem to have stuck to the “not enough people” argument for far too long. These communities are where growth is going to occur, and the Mayors of Langley, Surrey, Abbotsford and Coquitlam have all signed a “Livability Accord”. 65% of the growth in the Lower Mainland in the next ten years will be accommodated in these four communities. Even right wing politicians like Jordan Bateman in Langley are promoting streetcars or light rail as a way of making transit more attractive and permitting denser, transit oriented development. Indeed, the developed parts of Surrey are denser in total the developed parts of Burnaby. But the level of transit service is abysmal. Sensing this mood, I have been advocating that a pilot or demonstration project is what is needed now – not more studies. This is because studies actually do not win many arguments, and tend to lead to more debate and more studies. Indeed, as a consultant in private practice, I was only too happy to be commissioned to do a study – because of the high probability of subsequent work created by the release of the “final report” – which was usually anything but. People are, of course, skeptical – and quite rightly. But the fond memory of the interurban between Chilliwack and Vancouver is strong, and local enthusiasts have been fanning those flames for a while. Modern transit is actually rather different to the electrified Pullman cars that shuttled up and down the Valley for fifty years – until more than fifty years ago. But in 1968, for Expo, train service was restored briefly. And a lot of people are still wondering why trains seem to have been left out of most Olympic plans. The Select Committee turned out to be an interesting and diverse crowd. There were two (sometimes more) councillors – and different staff at different times. Most members were local citizens who had expressed an interest or were members of one of the rail advocate groups. There were a smattering of others, like myself, with some professional interest but who came from away. The Committee, by the way, did not pay for travelling expenses, so I picked up the tab for my monthly treks out to the east, and most times for supper too (except for last night when pizza was brought in). I tried hard to find a way to do the trip by West Coast Express but was defeated by the lack of transit accessible accommodation near City Hall. At the first meeting, back in June, I thought we were going to be arguing about freeways and intersections. Much was made of the need to incorporate Abbotsford Airport as it draws passengers from a wide area. The Interurban is also problematic for Abbotsford. Interregional connections that are most important are east-west. Mostly to Langley. Chilliwack having been, for most of recent history, sucessfully isolationist (most people who live in Chilliwack work there too). Mission has West Coast Express of course – and there is a timed bus that meets every train to connect to and from Abbotsford. But even so it is only really useful for travel to Vancouver in the early morning, and most of the travel in general (not just commuting) around Abbotsford is to adjacent communities. (Abbotsford and Mission share local transit service provision). The Interurban was built before Sumas Lake was drained, so its route is not direct. In fact in Abbotford it runs due north – south from the river to the US border at Huntingdon. And travel in those directions really did not concern us very much at all. For years, Abbotsford has had very low transit service,as local politicians were reluctant to pay towards empty buses. Kelowna, which is of comparable size, has twice the amount of transit service. But a quick glance around the city shows low density development, quite a lot of farmland and a major freeway, with a new lane being added in its generous median. So at the first meeting, I was not at all surprised that the Chamber of Commerce made a strong pitch for a “multi modal” approach. But over the summer the world changed. And so did Abbotsford. 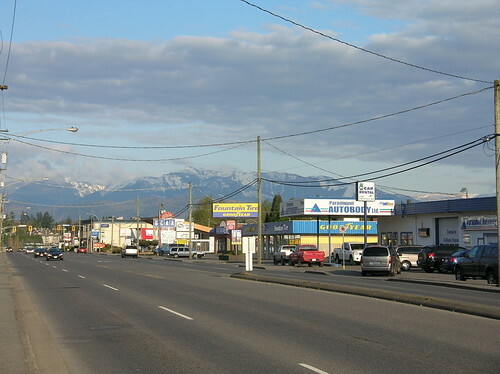 Abbotsford’s OCP calls for higher density development. But without better transit, that will not happen. In the fall sheet change, transit service increased significantly, with an emphasis on higher service frequencies on the busiest routes. This will not be an isolated change but is a signal of more to come. Oil prices peaked, and house prices tipped over the crest too. Development faltered, and then the credit crunch hit. People travel in the summer – and so do their families – and people on the committee started talking about what they and their children experienced elsewhere. Modern transit no longer seemed a distant prospect but both doable and necessary. I am not going to reveal what our recommendations are before Abbotsford Council has seen them, but I will say that I have been surprised – not least because last night we approved the report unanimously. Throughout the discussion has been positive and respectful. We are also getting a bit worried about what the outgoing Council might think. But we do know that the staff – and the new City Manager – are very progressive. We did promise to report before the Civic Elections, and we will do so. What is also relevant is that my shtick has also been going down well in Chillwack and Langley. Not just me of course, but a whole band of rail advocates – although there have been some fissures, I’m afraid. And in local politics they do seem to be inevitable. Turnout in local elections is notoriously low – below 30%. But those who do get involved are committed – and often driven. There is also change in the air. Simple demographics and aging boomers, with lots of new people arriving. Some of whom are now comfortably established and secure enough to raise their heads above concerns of simply getting established. It is probably significant too that Abbotsford has grown by incorporating neighbouring communities – and that at a time when bits of Langley and Surrey were splitting off those cities. So they know about building consensus. Though I live in the Big Bad City, I appreciate your strong advocacy and voluteer work for the Valley, Stephen. I worked in Langely for two years and am familiar with the physical and cultural geography. Perhaps the grassroots will drive hope & change at the provincial level regarding sustainability, of which decent public transit is a very important part. I don’t think valley residents will be bought off, by Falcon, with 10 km. more of SkyTrain. The groundswell of support for a reinstated interurban is growing and what give a moment of pause to politicians, it’s not the ‘trolley-jolly’ crowd that is supporting it. What makes sense with the present route is that it is there, in place; which is by far a lot cheaper than ‘greenfields’ construction. The cost to renew just the tracks is about $1 million/km. and Diesel LRT vehicles (small & light dmu’s) cost about $5 million to $6 million a copy. GPS/ATP signalling is relatively cheap, compared to old solid state signalling of just 10 years ago, which again was cheaper than earlier signalling methods. It’s all there and for the cost less than 1 km. of RAV/Canada Line we could have a reasonable ‘demonstration’ D-LRT service for the Fraser valley. For the cost of 3 km. of RAV/Canada Line we could go from downtown Vancouver to Chilliwack! The population is there, the track is there, the publics demand is there, and the technology is there; what is missing is the provincial political will to make it happen. Perhaps it is time for a realignment of the regional districts. Perhaps we need two or three regional districts, the GVRD for Vancouver and its surrounding suburbs, one to serve the emerging cities on the South Side of the Fraser (Langley, Abbotsford, Surrey, and one to serve and protect the last of rural living and farmland in the rest of the Valley (Maple Ridge, Hope, Agassiz, Mission, Chilliwack). It would work well if there was one body to oversee regional transit, the transit that connects all the parts of the whole, and local transit planning at the regional or city level. You are very right to say that there is growing discontentment with the kind and type of development being foisted on the region. One only has to watch the discussion surrounding the Genstar development proposal to understand the resentment that is growing in the region. In my humble opinion the days of urban planning done in the absence of reference to such vital services as transportation systems, health services, and local employment have to end. The Fraser Valley was long seen as the region that solved Vancouver’s housing affordability problem and everyone was expected to rely on Vancouver to provide the cultural and social amenities for the entire region. With the employment that now exists in the Fraser Valley and the emerging cities, as well as the opportunities for post-secondary education, and the cultural and social institutions that are developing in the region my sense is that there is a growing demand from people living in the region to develop their own livable and sustainable communities that are far less reliant on Vancouver.